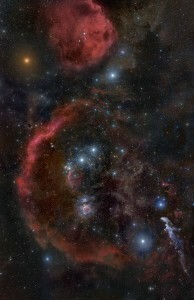 Orion’s Belt is one of the most familiar asterisms in the night sky, along with the Big Dipper and the Southern Cross. It is formed by three massive, bright stars located in our galaxy, in the direction of the constellation Orion, the Hunter: Alnilam, Alnitak and Mintaka. Two of the three stars are supergiants. Orion’s Belt is easy to find in the night sky as it is located on the celestial equator and part of one of the most prominent stellar patterns in the northern sky, the hourglass-shaped constellation Orion. The asterism and the constellation are visible in northern latitudes from November to February. The best time of year to observe the asterism is in January around 9 PM. Finding Orion’s Belt is the easiest way to locate Orion constellation, one of the best known constellations in the sky, which carries great significance across many different cultures, from Egypt to Greece and beyond. The three stars of the Orion’s Belt are pretty evenly spaced and form a more or less straight line, which makes them easy to locate. Because the belt stars are so prominent in the northern sky, they are associated with a number of stories and myths. The stars are known as the Three Kings, Three Marys, Frigg’s Distaff, Three Sisters, the Weighing Beam, and by many other names in different mythologies, from the Babylonians to Egyptians and Greeks. The Greeks associated the stars with the mythical hunter Orion, with the constellations Canis Major and Canis Minor representing the hunter’s dogs and the constellation Scorpius, representing the scorpion that killed Orion, placed on the opposite end of the sky so that the two are never above the horizon at the same time. In ancient Egypt, the stars of the Orion’s Belt were the symbol of Osiris, but the extent of their importance has only been speculated about. The belt stars are not perfectly aligned, and their alignment matches that of the three pyramids of Giza, while Orion’s orientation to the Milky Way matches the pyramids’ orientation to the river Nile. This has given rise to speculation that the three great pyramids were not just tombs, but also served as the pharaohs’ gateway to heaven. The constellation Orion was also associated with the Egyptian pharaoh Unas of the Fifth Dynasty. The three bright stars that form the Orion’s Belt are Alnitak, Alnilam, and Mintaka. The stars are believed to have formed from the same nebula in Orion constellation, and they are roughly the same age. The two stars at either end of Orion’s Belt – Alnitak and Mintaka – are actually closer together because the middle star, Alnilam, which is the brightest of the three, is also much more distant from Earth than the other two. 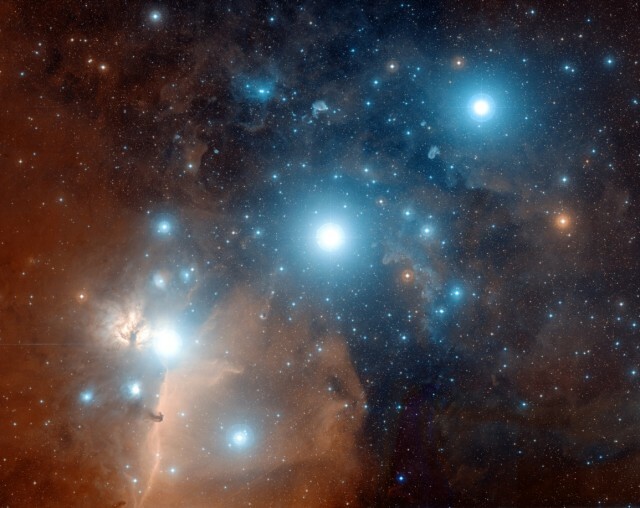 The belt stars are members of the Orion OB1b association, along with many other stars in this region, and they travel together through space. They were all formed inside the same molecular cloud about 4 million years ago. The stars were collectively known by different names in different countries and cultures, including the Weighing Beam in Chinese and Al Nijād (the Belt), Al Nasak (the Line), Al Alkāt (the Golden Grains/Nuts) and Al Mīzān al Ḥaqq (the Accurate Scale Beam) in Arabic. Pre-Christian Scandinavians knew them as Friggerock (Frigg’s Distaff) or Freyja’s Distaff. In Latin America, the belt stars are known as Las Tres Marías (Spanish) or As Três Marias (Portuguese), meaning the Three Marys. In Puerto Rico and the Philippines, the stars are called Los Tres Reyes Magos, referring to the Three Kings or the Biblical Magi who visited baby Jesus. Orion stars – Photo taken by Rogelio Bernal Andreo in October 2010 of the Orion constellation showing the surrounding nebulas of the Orion Molecular Cloud complex. Also captured are the red supergiant Betelgeuse (top left) and the famous belt of Orion composed of the OB stars Altitak, Alnilam and Mintaka. To the bottom right can be found the star Rigel. The red crescent shape is Barnard’s Loop. The photograph appeared as the Astronomy Picture of the Day on October 23, 2010. Alnitak, also known as ζ Orionis (Zeta Orionis) or 50 Orionis, is a triple star system located at the eastern end of the Belt of Orion. The star system is approximately 736 light years distant from Earth and over 100,000 times more luminous than the Sun. The combined apparent magnitude of the system is 1.72. The name Alnitak comes from the Arabic an-niṭāq, which means “the girdle.” The name is sometimes also spelled Al Nitak or Alnitah. The primary component in the Alnitak system is a close binary star composed of a blue supergiant belonging to the spectral class O9.7 Ibe and a blue dwarf with the stellar classification O9V. The supergiant has an apparent magnitude of 2.0 and an absolute magnitude of -5.25, and the dwarf has a visual magnitude of around 4 and an absolute magnitude of -3.0. The supergiant has a mass about 27 times that of the Sun and a diameter 19 times solar. It is the brightest O-class star in the sky, with a luminosity 180,000 times solar. The blue dwarf was only discovered in 1998. It has a mass about 19 times solar and a radius 7.5 times that of the Sun. The third component in the Alnitak system is a 4th magnitude B0-type star which orbits the main pair every 1,500 years. There is a 9th magnitude star along the same line of sight, but it is unclear whether it is physically related to the system or just an optical companion. Alnitak is located near the nebulous region IC 434, whose light is blocked by the Horsehead Nebula, a famous dark nebula in Orion. Other notable deep sky objects in this region are the emission nebula NGC 2024, also known as the Flame Nebula, and the reflection nebula NGC 2023. Alnilam, also known as ε Orionis (Epsilon Orionis) or 46 Orionis, is the middle star of the Orion’s Belt. It is located at a distance of 1,340 light years from Earth. The star is a large blue supergiant with a visual magnitude of 1.70 and an absolute magnitude of -6.37. Alnilam is the 30th brightest star in the sky and the fourth brightest in Orion constellation, after Rigel, Betelgeuse and Bellatrix. It has the stellar classification B0 Ia and is also classified as an Alpha Cygni type variable, which is to say it is a supergiant star that exhibits non-radial pulsations, with some portions of its surface contracting while others expand. Alnilam may evolve into a red supergiant over the next million years and eventually end its life in a supernova explosion. The star is losing mass around 20 times more rapidly than the Sun as a result of strong stellar winds, possibly reaching up to 2,000 km/s. Alnilam has a radius 30 times that of the Sun and is 375,000 times more luminous. 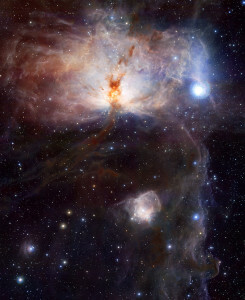 The star’s estimated surface temperature is 26,200 K.
The star is surrounded by NGC 1990, a molecular cloud turned into a reflection nebula by the light of the bright star. Mintaka, also known as δ Orionis (Delta Orionis) or 34 Orionis, is the westernmost star of the Orion’s Belt. It is a binary star approximately 916 light years from Earth. It has an apparent magnitude of 2.21 and an absolute magnitude of -4.99. It is 90,000 times more luminous and 20 times more massive than the Sun. The two stars in the Mintaka system orbit each other every 5.73 days. The system is classified as an eclipsing binary. Delta Orionis is really a multiple star system. The main component is the binary star, one consisting of a B-type giant (B0.5III) and a smaller yet hotter O-type star (O9.5 II). There is also a magnitude 7 star located 52” away from the primary component and another fainter star in between. Orion constellation can easily be found in the sky from November to February. For observers in the northern hemisphere, the constellation lies in the southwestern sky. For those in southern latitudes, Orion can be seen in the northwestern sky and appears to be standing on his head. The constellation’s hourglass shape is marked by the stars Betelgeuse, Bellatrix, Saiph, and Rigel, which are among the brightest stars in the night sky. Betelgeuse and Bellatrix mark the hunter’s shoulders and Saiph and Rigel mark his feet. 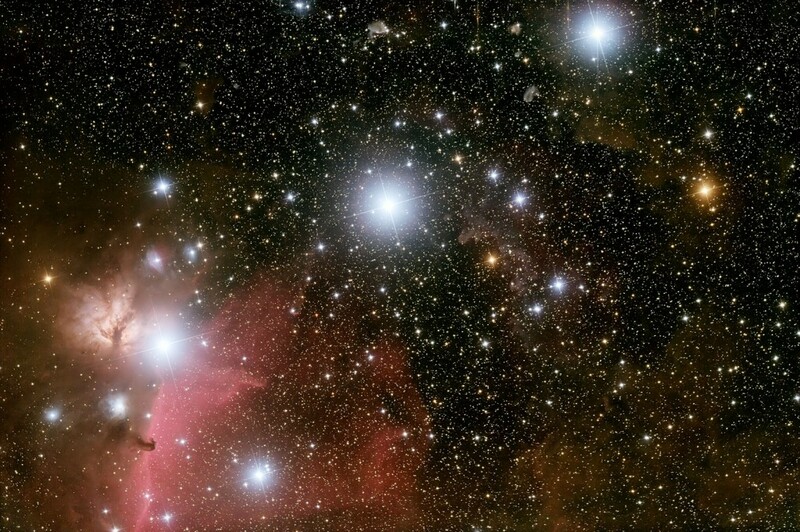 The stars forming a diagonal line below the Orion’s Belt form an asterism known as Orion’s Sword. The star lying in the middle of the sword is not a star at all, but the famous Orion Nebula (Messier 42), which appears as a patch of light to the naked eye on clear nights. 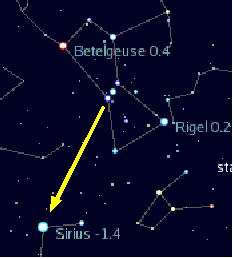 To the east, the line of the Orion’s Belt points toward Sirius, the brightest star in the sky, located in Canis Major constellation. To the west, the three stars point in the direction of Aldebaran, the brightest star in Taurus constellation, and make it easy to locate the famous Pleiades (Messier 45) and Hyades star clusters. The shape of different constellations and asterisms changes over time as a result of stars not being stationary and moving through space, but the three stars of the Orion’s Belt share the same origin and have the same proper motion, which means that they travel together, with the asterism retaining a similar shape over the centuries. This means that the Orion’s Belt looked almost the same in ancient times as it does now. In ancient Egyptian mythology, Orion and the bright star Sirius represent Osiris and Isis. Ancient Egyptians believed that the gods descended from Sirius and the Belt of Orion, and instigated the human race. 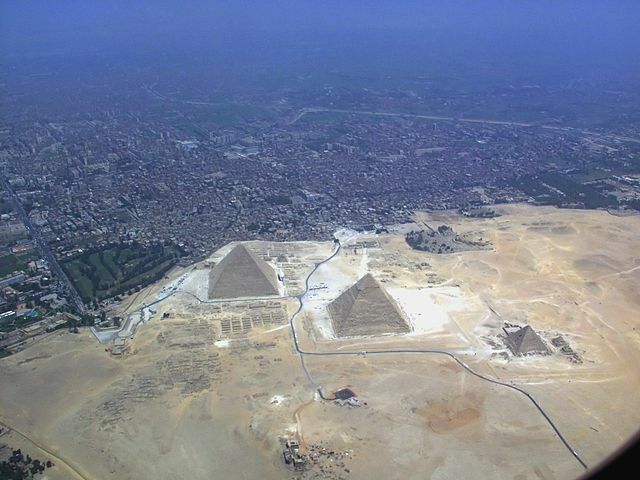 The three pyramids on the Giza Plateau simulate the alignment of the three belt stars, and the air shafts inside the pyramids point directly toward Orion constellation. They are believed to be there to project the pharaoh’s soul toward Orion. While this theory remains a theory, the correspondence between the stars and the pyramids is quite remarkable. A similar correspondence was discovered in the ruins of the ancient city of Teotihuacán, which lies 35 miles to the northeast of Mexico City. Two large pyramids and a temple, believed to have been built in the 2nd century BC, point directly to the Orion’s Belt and their layout mimics that of the three belt stars. The construction of the ancient city was attributed to a race of giants, the Quinametzin Giants, who were believed to have populated the world in an earlier era. The pyramid of the Sun in Teotihuacán is exactly half as tall as the Great pyramid of Giza.